Intima-media thickness (IMT) is a validated marker of preclinical atherosclerosis and a predictor of cardiovascular events. We studied a population of 529 asymptomatic patients (age 62 ± 12.8 years), divided into two groups of subjects with and without Metabolic Syndrome (MetS). All patients, at baseline, have had a carotid ultrasound evaluation and classified in two subgroups: the first one without atherosclerotic lesions and the second one with preclinical atherosclerosis (increased IMT or asymptomatic carotid plaque). Cardiovascular endpoints were investigated in a 20-years follow-up. There were 242 cardiovascular events: 144 among patients with MetS and 98 among in healthy controls (57.4% vs. 35.2%; P < 0.0001). 63 events occurred in patients with normal carotid arteries, while 179 events occurred in patients with preclinical atherosclerosis (31.8% vs. 54.1%; P < 0.0001). Of the 144 total events occurred in patients with MetS, 36 happened in the subgroup with normal carotid arteries and 108 in the subgroup with preclinical atherosclerosis (45% vs. 63.15%; P = 0.009). 98 events occurred in patients without MetS, of which 27 in the subgroup with normal carotid arteries and 71 in the subgroup with preclinical atherosclerosis (22.88% vs. 44.37%; P = 0.0003). 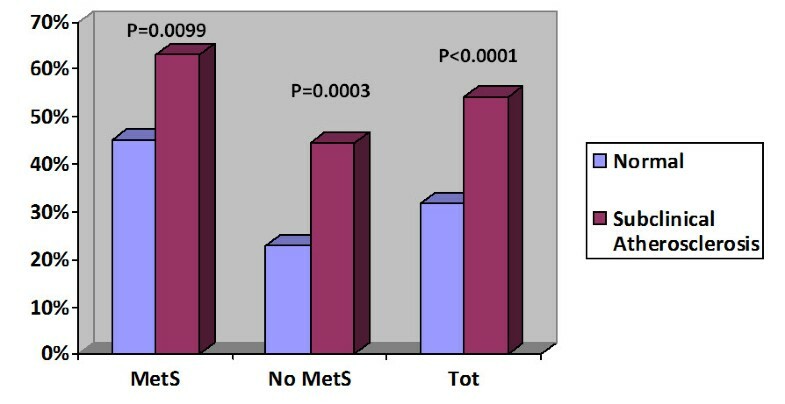 In addition, considering the 63 total events occurred in patients without atherosclerotic lesions, 36 events were recorded in the subgroup with MetS and 27 events in the subgroup without MetS (45% vs. 22.88%; P = 0.0019). 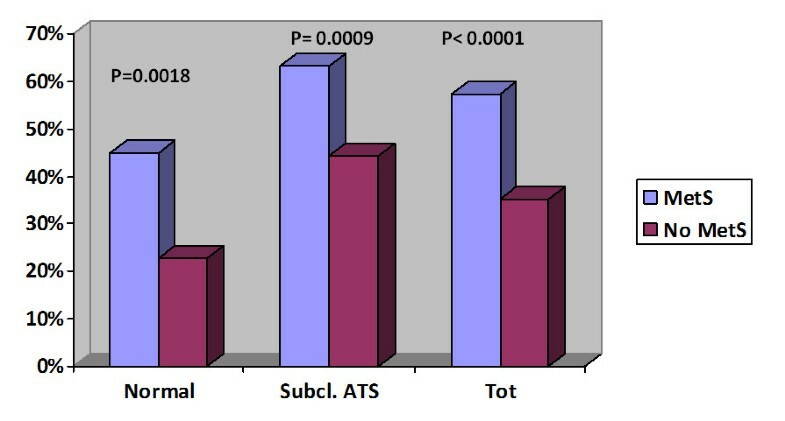 Finally, in 179 total events recorded in patients with preclinical carotid atherosclerosis, 108 happened in the subgroup with MetS and 71 happened in the subgroup without MetS (63.15% vs. 44.37%; P = 0.0009). The Kaplan-Meier function showed an improved survival in patients without atherosclerotic lesions compared with patients with carotid ultrasound alterations (P = 0.01, HR: 0.7366, CI: 0.5479 to 0.9904). Preclinical atherosclerosis leads to an increased risk of cardiovascular events, especially if it is associated with MetS. The atherosclerotic process starts in childhood and proceeds silently over a long period of time before clinical manifestations. However, atherosclerosis is a significant cause of death in the developed countries and quite frequently it presents as a fatal event, hence the interest in detecting it in its subclinical stages . Carotid artery Intima-Media Thickness (IMT) reflects the structural deterioration of the arterial wall, so it is considered a significant predictive marker of generalized atherosclerosis because of its correlation with coronary artery disease and it may predict future cardiovascular events in adults . It is associated with established vascular risk factors (hypertension, dyslipidemia, diabetes mellitus, and smoking) or with less-conventional risk factors such as homocysteine, inflammation markers (C-reactive protein, fibrinogen) or uric acid [2–11]. The Metabolic Syndrome (MetS) represents a clustering of several cardiovascular (CV) risk factors including abdominal obesity, impaired glucose intolerance, dyslipidemia, and hypertension, with insulin resistance as a major characteristic [12–14]. MetS has got a high prevalence in the US population; in people >20 years old it is 24% and it rises to > 40% in patients ≥ 60 years of age [15, 16]. Several clinical studies recognized MetS as responsible for the endothelial dysfunction, which is the first “step” in atherothrombotic disease and, in addition, it is observed the association between an increased Carotid intima-media thickness (C-IMT) and MetS [3, 16–21]. The current study is the implementation of a study published in the month of August 2012 , with new data aiming to identify the influence of carotid preclinical atherosclerosis on prediction of cardiovascular events during a 20-years follow-up in a population of middle-aged subjects. We also evaluated the role of the metabolic syndrome on the risk of cardiovascular events comparing groups with preclinical atherosclerotic lesions. Our study was performed on a population of 529 asymptomatic patients, aged between 25 and 87 years old (62 yrs ± 12.79) at baseline, divided in 257 male patients and 272 females, who were attending twenty years ago our “Centre for the Early Diagnosis of Preclinical and Multifocal Atherosclerosis and for the Cardiovascular Prevention”, in Palermo, Italy. We identified 529 asymptomatic subjects at baseline from our registry of more than 9000 patients referred from 1985 to 1991 and in follow-up in our centre. From this registry we selected the population evaluated in the present study with MetS, according to the document of Scientific International Societies - International Diabetes Federation (IDF), National Heart, Lung, and Blood Institute (NHLBI), World Hearth Federation, International Atherosclerosis Society e American Heart Association (AHA) – published in 2009 , which defined MetS as an alteration in 3 or more of the following 5 components: abdominal obesity, triglycerides, high-density lipoprotein (HDL) cholesterol, blood pressure (BP), and fasting plasma glucose. The following cut-off values were used to define alterations: waist circumference >102 cm for men and >88 cm for women for abdominal obesity, triglycerides ≥150 mg/dL (1.69 mmol/L), HDL-cholesterol <40 mg/dL (1.04 mmol/L) for men and < 50 mg/dL (1.29 mmol/L) for women, BP ≥ 130/≥85 mm Hg and fasting glucose ≥ 100 mg/dL. The choice of cutoff values for waist circumference was done according to the recent published consensus, taking into consideration the geographic distribution . The most common CV risk factors (lifestyle, dietary habits, smoking, family and personal history of CV disease) were investigated. Moreover we evaluated the anthropometric parameters (weight, height, and waist circumference) and the laboratory ones (fasting triglycerides, HDL-c, fasting glucose and fasting insulin), as well as blood pressure. 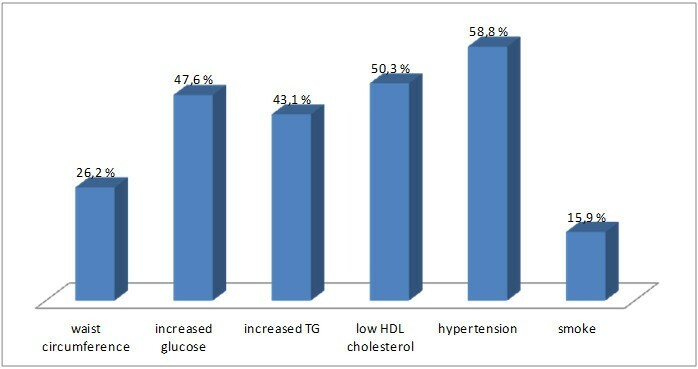 Figure 1 shows the prevalence of the mean cardiovascular risk factors in the population evaluated. Prevalence of the cardiovascular risk factors in the study population. Body mass index (BMI) has been calculated as weight in kilograms divided by the square of height in meters. Waist circumference was calculated as the average of 2 measurements taken after inspiration and expiration at the midpoint between the lowest rib and iliac crest. Blood pressure (BP) measurements were performed with participants in the seated position and after a quiet resting period of 5 minutes. BP was measured in both arms with a random-zero mercury sphygmomanometer; the BP values used in this study are the average of the measurements on both the right and left arms. Pulse pressure was computed as the difference between the systolic. BP (SBP) and the diastolic BP (DBP). Low-density lipoprotein (LDL) and high-density lipoprotein (HDL) fractions were separated from fresh serum by combined ultracentrifugation and precipitation; triglycerides were measured enzymatically. Blood glucose was measured using a glucose dehydrogenase method after precipitation of proteins by trichloroacetic acid. We excluded patients affected by cancer, inflammatory bowel disease and with other autoimmune disorders because these diseases were considered as confounding variables for their ability to power the atherosclerosis process. Our research was carried out in compliance with the Helsinki Declaration and with international guidelines for the research on humans. Ultrasound examination was performed in all patients at baseline, in order to investigate the presence of preclinical atherosclerosis. B-mode real-time ultrasound was used to evaluate the arterial wall thickness in the carotid arteries using a machine Toshiba 270 SS with a probe of 7.5 to 10.0 MHz . The power output, focus, depth of measurement, and gain were standardized by using the preset program incorporated within the software package of the ultrasound equipment. The IMT was defined as the distance between the echogenic line representing the intima- blood interface and the outer-echogenic line representing the adventitia junction. After freezing the image, the measurement was made with electronic calipers. Patients were examined in the supine position, and each carotid wall and segment was examined to identify the thickest intimal-medial site . Three segments were identified and measured in anterior and posterior planes on each side: the distal 1 cm of the common carotid proximal to the bifurcation, the bifurcation itself, and the proximal 1 cm of the internal carotid artery. At each of these sites, we have determined the IMT, automatically measured, and detected any possible plaque. We primarily used the maximum carotid IMT value, which was determined as the mean of the maximum IMT of near- and far-wall measurements of both the left and right side arteries for each of the 3 arterial segments. If data on one of the walls or one of the sides were missing, maximum thickness of the available wall and side was used. The percentage of missing data was ≈ 35% (probably because of technical difficulties in the evaluation). Ultrasound examination was performed by one investigator, in blind and with no possibility of reproducing the IMT measurement. Carotid ultrasonography was performed by one sonographer to limit the risk of a large interobserver variability. However, for methodological correctness, the intraobserver agreement for sonographic measurement was calculated with a 4.1% to 5.0% coefficient of variation for repeated scans. Cardiovascular endpoints were investigated in a 20-years follow-up: acute myocardial infarction (AMI), angina pectoris, transient ischemic attack (TIA), ischemic stroke, abdominal aortic aneurysm (AAA), thromboendarterectomy (TEA) and cardiovascular death. Not fatal events were investigated through clinical controls during the follow-up in hospital. Fatal events were ascertained through the interrogation of family members or death certificates. Descriptive statistics were presented as percentages for categorical variables and as mean values ± standard deviation (SD) for continuous data. Differences between groups were compared by the Chi-square test for categorical variables. In addition, free-events survival was tested by Kaplan-Meyer function and log-rank test. A p-value < 0.05 was considered statistically significant. Statistical analysis was performed using the Med Calc Program. Our population of 529 patients was divided into two categories, a first one with 251 patients suffering from metabolic syndrome and another one with 278 control subjects who had from 0 to 2 risk factors, so considered as controls. Both groups (participants with MetS and control subjects) were homogeneous about age, gender, smoking, diabetes and family history for CV diseases. The mean values of each component of MetS are showed in Table 1. According to the results of this ultrasound examination our patients were divided into three categories: 198 “normal subjects” (IMT < 0,9 mm), 162 patients with increased IMT (IMT > 0,9 mm and < 1,5 mm) and 169 patients with asymptomatic carotid plaque (IMT > 1,5 mm). In each of these groups, we identified two subgroups of subjects with or without MetS. Table 2 shows how it is more probable to find patients without MetS in the “normal subjects” subgroup (P = 0.015); on the contrary, in patients with increased IMT/asymptomatic plaque (331 patients) the presence of MetS is more frequent (P = 0.015). BMI: body mass index; HDL: high density lipoprotein cholesterol. MetS: metabolic syndrome; IMT: intima-media thickness. Normal IMT: < 0,9 mm; Increased IMT: > 0,9 mm and < 1,5 mm; Asymptomatic carotid plaque: IMT > 1,5 mm. During the follow-up there were 242 cardiovascular events: 144 in patients with MetS (251 patients) and 98 in healthy controls (278 patients); (57.4% vs. 35.2%; P < 0.0001). As to the presence or absence of carotid preclinical atherosclerosis, 63 events occurred in patients with normal carotid arteries (198 patients), while 179 events occurred in patients with preclinical atherosclerosis (increased IMT/asymptomatic plaque; 331 patients); (31.8% vs. 54.1%; P < 0.0001). In the 144 total events occurred in patients with MetS, 36 happened in the subgroup of patients with normal carotid arteries and 108 happened in the subgroup of patients with preclinical atherosclerosis (45% vs. 63.15%; P = 0.0099). Similarly, in the 98 total events occurred in patients without MetS, 27 developed in the subgroup with normal carotid arteries and 71 in the subgroup with preclinical atherosclerosis (22.88% vs. 44.37%; P = 0.0003). So, preclinical atherosclerosis produced a significant increase of the risk of events, especially in presence of MetS (Table 3; Figure 2). In addition, in the 63 total events occurred in patients without atherosclerotic lesions, 36 events were recorded in the subgroup with MetS and 27 events in the subgroup without MetS (45% vs. 22.88%; P = 0.0018). Of the 179 total events recorded in patients with atherosclerotic lesions, 108 events happened in the subgroup with MetS and 71 events in the subgroup without MetS (63.15% vs. 44.37%; P = 0.0009). So, both in patients with preclinical atherosclerosis and in patients without atherosclerotic lesions the presence of MetS increased the risk of CV events (Table 3; Figure 3). Comparison of incidence of events in the subgroups of study. Distribution of cardiovascular events in relation to preclinical atherosclerosis and MetS. MetS: metabolic syndrome. Preclinical carotid atherosclerosis: increased IMT or asymptomatic carotid plaque. Finally, comparing the subgroup without MetS and without atherosclerotic lesions to the subgroup affected by MetS and preclinical atherosclerosis, the second group showed a higher incidence of cardiovascular events (22.88% vs. 63.15%; P < 0.0001); (Table 3). ● In patients without preclinical atherosclerosis (normal; 198 patients) occurred: 12 cases of angina, 11 AMI, 13 TIAs, 14 strokes, 2 AAA, 1 TEA and 10 cardiovascular deaths. ● In patients with carotid ultrasound lesions (IMT or asymptomatic plaque; 331 patients) occurred: 21 cases of angina pectoris, 49 AMI, 35 TIAs, 33 strokes, 4 AAA, 4 TEA and 33 cardiovascular deaths. AMI: acute myocardial infarction; TIA: transient ischemic attack; AAA: abdominal aortic aneurysm; TEA: thrombo-endo-arterectomy. In order to assess the role of preclinical atherosclerosis, the event-free survival was evaluated in patients with and without carotid ultrasound lesions by Kaplan Meyer function (Figure 4). It showed an improved survival in patients who had not atherosclerotic lesions (P = 0.0159, HR: 0.7366, CI: 0.5479-0.9904). Event-free survival according to the Kaplan Meyer function. Cardiovascular diseases (CVD) are the leading cause of morbidity and mortality in Americans and Europeans. Signs of CVD are evident in the vessels before the onset of clinical disease symptoms. Subclinical disease can be measured using non-invasive B-mode ultrasound in order to assess common carotid artery intima-media thickness. Vascular aging is a natural process that can be modified by lifestyle and pharmacologic interventions. IMT is measured as the distance between the lumen-intimal interface and the medial-adventitial interface. The measurement varies depending on several factors: the used carotid artery (both the left and the right side or only one side); the artery segment(s) (common carotid, internal carotid, bulb); whether near and far wall images are used and whether plaque is included in the measurement. Typically IMT is the average of all available segments and sides. It is reliable, reproducible  and measured in a wide variety of populations [27–31]. Several studies have demonstrated the relationship between thicker IMT and/or carotid plaque and traditional cardiovascular risk factors like age, smoking, type 2 diabetes, hypertension, higher low density lipoprotein (LDL) cholesterol [27, 31]. It has been also described that preclinical atherosclerosis is associated with type 1 diabetes in young adults  and with gestational diabetes [33, 34], showing an increased C-IMT in these patients comparing it to controls. IMT and carotid plaque are indicators of atherosclerosis and predictors of myocardial infarction and cardiovascular mortality [35, 36]. A thicker IMT predicts coronary heart disease , stroke , and myocardial infarction [29, 31]. A 5,5 years-follow-up showed that the risk of myocardial necrosis increases for about 10- 15% just if IMT increases for 0,1 mm while the risk of stroke increases for about 13- 18% . Moreover other studies underlined that the Metabolic Syndrome could produce a more rapid deterioration of brain function, because it seems to be related to a low gray matter cerebral blood flow (GM-CBF) and to a lower immediate memory function if compared to control subjects . The results of IMPROVE Study (Carotid Intima-Media Thickness [IMT] and IMT-Progression as Predictors of Vascular Events in a High Risk European Population) compared the performance of several measures of C-IMT as predictors of cardiovascular events and investigated whether they add to the predictive accuracy of Framingham risk factors. Therefore, this study suggests that a risk stratification strategy based on C-IMT and ICCAD (inter-adventitia common carotid artery diameter) as an adjunct to Framingham risk factors is a rational approach to prevent cardiovascular diseases . Our data confirm the results of other clinical studies (nationals and internationals) that have examined the relationship between preclinical atherosclerosis, MetS and CV risk [40–43]. We demonstrated that the presence of preclinical atherosclerosis lead to an increased incidence of cardiovascular events, especially if it is associated with MetS. In fact, total cardiovascular events were more frequent in the group of patients with carotid preclinical atherosclerosis compared to patients with normal carotid arteries (P < 0.0001). Similarly, both in patients with MetS and in patients without MetS cardiovascular events were more frequent in presence of preclinical atherosclerosis than without these lesions. 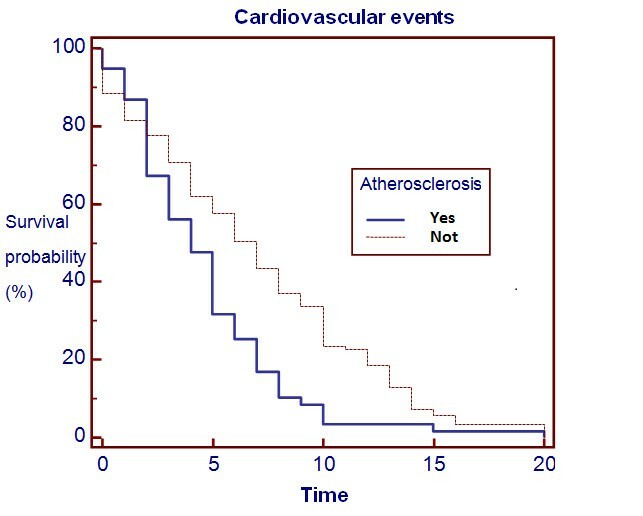 Moreover, also the importance of MetS resulted significant, in fact, both in patients with preclinical atherosclerosis and in patients without atherosclerotic lesions the presence of MetS increased the risk of CV events. Event-free survival was lower in patients with preclinical atherosclerosis than in healthy subjects (P = 0.0159, HR: 0.7366, CI 0.5479-0 0.9904). Another study also described that progression of carotid preclinical atherosclerosis is greater especially in cases of MetS . In a study conducted on 1442 men and 1532 women it was observed that subjects with MetS had higher levels of IMT and total plaque area (TPA) at follow up than those without MetS and that Mets predicted progression of IMT and TPA in patients below 50 years old . According to the recent ESC 2012 guidelines on cardiovascular prevention, the detection of an asymptomatic carotid plaque put subjects in the very high risk category . Therefore we suggest to investigate the presence of preclinical atherosclerosis in all patients > 45 years old by a carotid echo color Doppler test, because, in primary prevention, the IMT measurement can give further information for a better stratification of global cardiovascular risk [42, 45]. We also recommend preventing the development of Metabolic Syndrome’s abnormalities, encouraging daily physical activity and Mediterranean diet and starting early pharmacological treatment of modifiable risk factors . Preclinical atherosclerosis leads to an increased risk of cardiovascular events, especially if it is associated with Metabolic Syndrome. Therefore, preclinical atherosclerosis added to traditional risk factors can improve the cardiovascular risk prediction [37, 47], especially in presence of metabolic abnormalities. inter-adventitia common carotid artery diameter. SN: responsible for the critical review of the manuscript; AP: responsible for the follow-up of patients; RLT: responsible for writing the paper; FPG: responsible for statistical calculation and elaboration; DDL: responsible of the data base; IM, responsible for carotid ultrasound evaluation; GN: responsible of the ideation. All authors read and approved the final manuscript.